This morning I had to take a pregnancy test, as I sat there waiting my mind was trying to focus logically. I was bleeding for 11 days, I had contractions and cramping, there was no chance that my pregnancy could have survived. But there was a tiny part of me with a little bit of hope even though I knew if it was positive it wouldn’t have been a pregnancy, it would have been retained tissue and that would mean a surgical procedure. And then I saw the words ‘Not pregnant’ it was a feeling of relief and devastation all in one. I went into my husband and said it’s over. But the truth is, it’s not over. This is the 3rd time and now we are in that 1 in 100 who struggle with recurrent miscarriage. In October 2018 we found out we were pregnant for the first time. I felt so lucky to have a positive pregnancy test in our first cycle. We were so excited, making plans about how to tell our friends and our family. But at 4 weeks 4 days there was one spot of blood, about the size of a 5p coin. We called 111 and spoke to the doctor and he said a bit of bleeding can be normal but suggested taking the day off work and resting. I felt a bit of a fraud taking a day off for a spot of blood so I went to work. I was nervous and kept going to the bathroom to make sure there wasn’t any more blood. There wasn’t. There was nothing else until the next day, I started having cramps and then by the evening I was bleeding heavily. The pain was excruciating, I kept getting contraction like pains and I was bleeding clots. We tried to get an emergency appointment but they were very busy that night and eventually I fell asleep. We managed to get an appointment first thing the next morning. The doctor listened to what happened, had a quick feel of my tummy and simply said it looks like a miscarriage. That was it; I had to ask what happened next and whether I should take time off work. We left feeling alone and confused. We were both in shock, you hear of miscarriage but I was naive and I just didn’t think it would happen to me. I went back to work after the recommended three days and just burst into tears as soon as I got there. I tried to focus on my job and I tried to keep going with my commitments with friends, but I didn’t feel like me anymore. I felt lost for weeks like I was in a daze; I thought about everything I did after I found out I was pregnant. I lifted a bucket of water, I had a hot bath and I went to work that day the doctor advised me to rest. I thought it was my fault, that I caused the miscarriage. I felt like a failure, my body failed me doing the thing it was designed to do and I felt like there was something wrong with me. We tried again after one cycle and once again I felt lucky, in early December we got a positive pregnancy test. I was nervous but this pregnancy felt different and soon I felt positive and the excitement began to return. However when I reached 5 weeks I took another digital test but it showed up as ‘1-2 weeks’ I panicked as it should have read 2-3 by now. I tried to wait it out but when I was almost 6 weeks, I took another test and it said ‘Not pregnant’ Thankfully the GP got us a scan at an EPU so I drove straight there. They did a pregnancy test which was a weak positive. I had my scan and the nurse herself emotionally told me that there was a tiny sac that was too small. I got a blood test taken and that night they called to say I had a HCG level of 8 and that it would miscarry very soon. The next day, I started bleeding. I was devastated and to make it even worse, it was two weeks before Christmas and all I wanted to do was run away. It was the hardest Christmas we had to get through. We decided to wait a bit longer this time to give my body time to recover, we tried to focus our minds on positive things so we booked our bucket list trip to Iceland and in February we saw the Northern Lights. I really felt like our luck was changing and once we returned, we started trying again and to our surprise, first cycle we got another positive test. But I didn’t feel excited this time, I felt sick with nerves. I couldn’t put my finger on it but something just didn’t feel right. I put it down to the anxiety of what happened with the first two pregnancies. I became focused on testing and monitoring the line progression. We contacted the EPU when I saw there was a lack of progression and they brought me in for an examination, my cervix was normal for pregnancy and my HCG showed a level of 62. They said this was okay, in the normal bracket for early pregnancy, but I didn’t feel reassured. I could feel that it just wasn’t going to be okay. They monitored me with blood tests every couple of days but my gut instinct was that this pregnancy was over. I had a very slight rise in HCG and they had me in for a scan the next day concerned for an ectopic pregnancy. I was taken into the same room that I had been in during the second pregnancy, the same picture of Santorini on the wall. I did the same as I did the last time; I stared at that picture as she started the scan. She couldn’t find it; it was a pregnancy in an unknown location. I felt terrified as the nurse confirmed that the pregnancy wouldn’t survive and I started praying that my HCG would start decreasing knowing that the reality of an ectopic would be worse than a miscarriage. The next blood test showed a large decrease but high progesterone and I just had to wait to see what would happen next. When I started bleeding on the Monday afternoon at 5 weeks 2 days, I actually felt relieved; I just wanted it to be over. I don’t even have any words to describe how we feel right now, it feels surreal. I’m 29 years old and I never thought this would happen to us. I think about where I should have been in each pregnancy, I wonder whether they would have been boys or girls. 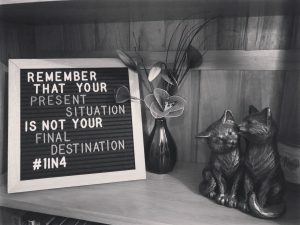 Pregnancy loss is so isolating and it shouldn’t be, 1 in 4 women have a miscarriage, that is a lot of women and couples who face this devastating loss. Yet we feel we can’t talk about that loss in case other people feel awkward. I shouldn’t have to pretend that this didn’t happen. That isolation is one of the reasons why I have chosen to share my story; I don’t want others to feel like they’re alone. Our next step is to take some time to grieve our losses; we have chosen to plan another trip together to help us have something positive to focus on. We are going to visit Rome and Venice and enjoy our time as a couple, we have been through a lot in our first year of marriage and I want us to remember who we are as people. We have three due dates that are etched into my mind. June 11th, August 11th and November 29th. We are hoping to do something special to mark each other these. We’re now waiting for our referral for further investigations into recurrent miscarriages and we are trying to keep strong and positive, we won’t give up on our dream of having a family.